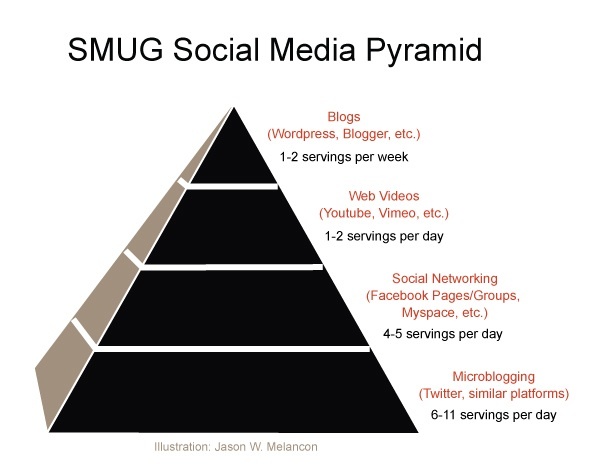 I appreciate all the positive feedback and re-tweets for yesterday’s post on the SMUG Social Media Pyramid. We even have our first graphical representation (click image to enlarge), submitted by Jason Melancon from the Louisiana Public Health Institute (LPHI). One point that Jason mentioned in his email deserves further amplification. He said “I think the servings on social networks (in my own opinion) should be per week as opposed to per day.” And this leads me to the discussion of portion size and servings. Have you ever noticed after drinking a 20 oz. bottle of Coke, when you turn it around and read the label, that you’ve just swallowed 2.5 servings? Or when you nuke a bag of microwave popcorn, do you always share it with two other people, as the label would indicate you should? Welcome to the world of unrealistic portion sizes, at least in America. It likely helps to explain our obesity epidemic, but it also has application when we’re looking at our SMUG Social Media Pyramid and what a “serving” is. On the SMUG Pyramid, essentially any activity qualifies as a “serving.” The tweet I will do about this post is a serving. A reply to those who re-tweet is a serving. And tweeting a link to another interesting article is, too. Relatively easy to get your 6-11 servings per day. In the social networking sites, the reason I have 4-5 servings per day instead of per week is because posting a link is a serving. So is interacting with someone who writes on your wall, or uploading a photo, or creating an event, or uploading a video. At the higher levels, Web Video and Blogs, the criterion for what constitutes a serving is a little higher. You can’t do half a video, and you either publish a new blog post or your don’t. But the interacting you do on YouTube, for instance, actually falls more within the social networking servings. So your 4-5 daily social networking “servings” may include comment activity both on Facebook and YouTube. The other point to remember is that a pyramid like this is just a general guide, and your situation may call for different portions. I’m 6’6″ and weigh (…well, let’s not get into that!) My food portions are going to naturally be bigger than a 5’2″ female. At least it’s how I rationalize eating the whole bag of microwave popcorn. And despite that, I know I don’t always get the five servings per day of fruits and vegetables that USDA suggests. 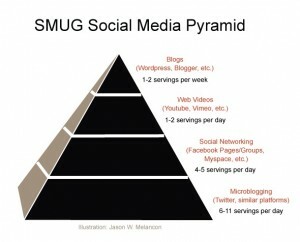 The SMUG Social Media Pyramid is just a guide; a framework for thinking about social media involvement. Unlike the USDA, I can’t say it’s based on scientific research. I also have to confess that sometimes I get out of balance with it, both in my personal accounts and at work. Sometimes I overload on Twitter, for instance, and don’t get enough servings of the others. But just as you’re not going to drop dead tomorrow for failing to eat enough fruits today, there’s flexibility with your social media diet too. You’re looking for balance over time for maximum health. In a future post I’ll discuss the real key to portion estimation, which is serving with your servings.